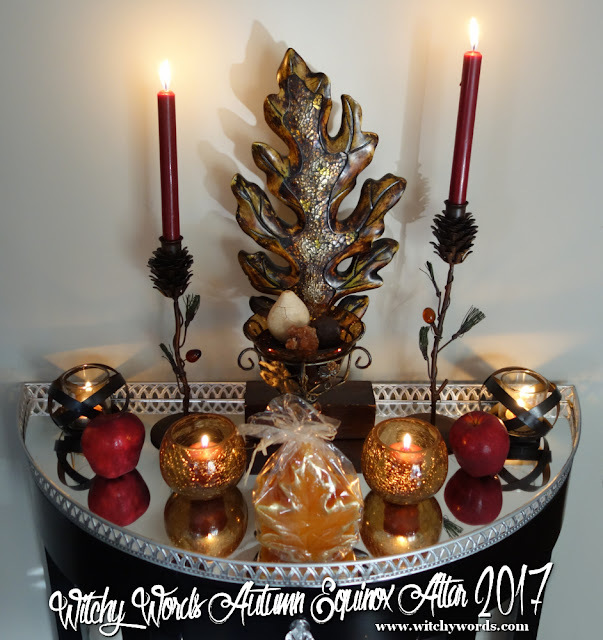 To see 2015's Autumn Equinox altar, click here! The fall equinox is a time period where day and night are (relatively) equal, creating a holiday of both personal and external balance. After this equinox, the days will shorten and nights will lengthen. We now enter the darker half of the year. Mabon is also the second harvest of three harvest festivals each year. Late September is the perfect time to begin harvesting nuts, pears, apples and more. It's during this time that I often first notice the change of the leaves and a chill in the air. Samhain is coming soon. To represent the second harvest, I started my altar with two red candles set in pine cone holders. I chose red because it's one of the seasonal colors; falling leaves often turn a variety of red or orange in my area. Red is the color of strength, love and courage, which are essential attributes to the family, relationships and love that we often celebrate at this time. Because the turn of the leaves are such a major part of my Mabon experience, I honored that with a large leaf statue I ran across at a thrift store. This thing is gorgeous, heavy and covered in bronze. Bronze is the color of wood and represents endurance, stability and offering. We have endured the hard summer months and we will endure the cold ahead. We will offer our thanks and take solace in the stability of those around us. the last color I mixed into the altar was orange. Orange is a color of energy, warmth and joy, which are all present during this season of gratitude. Apples are the primary harvest in late September. Representing wisdom and planning, apples caution us to think before we leap and prepare for the journey ahead. In the offering bowl, I placed a dried pear, a candlenut and an aragonite crystal. The pear is another seasonal harvest that represents happiness, love and affection. Aragonite is a crystal of nurturing and understanding. Together, the pear and aragonite create the perfect atmosphere for family and friends. The candlenut is added for light; candlenuts get their name for being used as in candles to light, guide and protect. The last item on the altar is this orange candle, still wrapped, clean and pristine. For the first harvest, I placed a green candle representing the still-green leaves. As they turn and fall, they become a variety of yellows, reds and, of course, oranges. Thus this candle represents the time of year and the second harvest. Above the altar, I placed a thinner wreath than the one I used at August Eve. In fact, I eventually decorated the wreath for Lammas with green ivy. This one for the equinox is decorated with fall leaves. The next one for Samhain will be bare. The nights grow longer and the days colder. Soon, the veil will thin. Until then, enjoy this diagram of my equinox altar! I hope everyone had a wonderful Autumn Equinox!